When many people think of the multitude of cultures that inhabit their cities, it’s usually based around food: “Yeah, we’re diverse. There’s a great Indian restaurant two blocks from my house.” And that’s a start, but we too-often ignore the massive amount of art that shows how the USA is truly one big cultural and creative mosaic. America, in a sense, belongs to the world, and the world has contributed much of its best to America. Everywhere in this country you can find art that showcases the value of our diversity. And you don’t have to detour into a museum to see it, either. Here are some choice global creators whom every traveler should seek out and enjoy on public display. Located in Grant Park, The Agora sort of looks like a scene from a surreal horror movie. And it should. 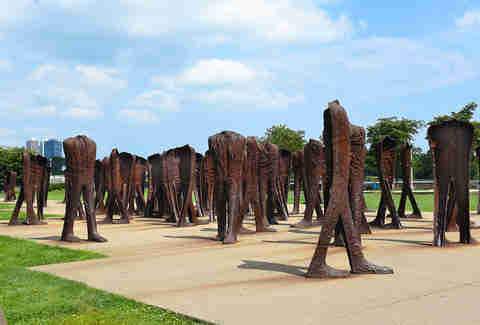 Polish sculptor Magdalena Abakanowicz donated this installation, which consists of 106 headless bodies. Why are they headless? Well, born in 1930, Abakanowicz was deeply affected by both World War II and the 45 year Soviet rule that succeeded it. Over and over again, she watched crowds mindlessly gather around spirited individuals who would end up ruining the lives of the people that they’d promised to protect. The “collective hate and collective adulation” fascinated her, and so, when building these, she stopped at the shoulders, because when crowds gather, people tend to lose their minds. From Belgium, ROA is distinct on this list. And that’s because ROA is more interested in a different part of our earth: the animal kingdom. It’s important to consider the many nationalities that inhabit the world, but it’s also important to consider the fact that we have some important fauna around here, too. 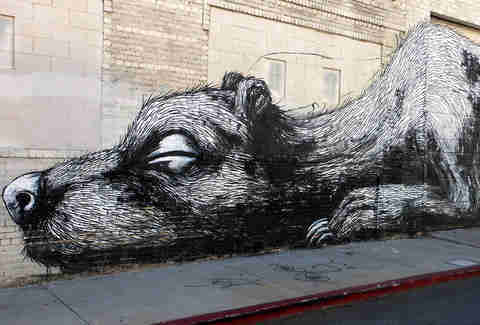 ROA’s work is vibrant, despite the fact that he mostly works in blacks and whites. But despite the lack of hues on his palette, the animals that he depicts are magnificently grand. He can turn a snail into something of Tolkien proportions, and his paintings of birds will force you to renew your faith in feathers; under ROA’s keen hand, they become damn near mythical. His art is a commingling of life and death, as when he gifted Los Angeles with a bear that may or may not be hibernating, but is surrounded by bones; and around the corner a bear skeleton decays. Much of ROA’s work at the intersection of Jesse Street and Imperial Street has been painted over, but you can still see the remains of his artistry, and his chipmunk murals across the street are still largely intact. Born in Brazil, Alexandre Keto began with a more familiar street art style but switched gears when he felt compelled to be more representative of the people who lived around him -- as he puts it, “black-skinned people, since they were not being appreciated or represented in any other way.” Immediately, his work caught local notice and actually cemented the community, by provoking discussion among a favoring public. With that in mind, Keto creates wonderfully stylized images that blend gorgeously into any canvas he chooses -- whether that’s actual canvas (he paints traditionally in acrylic) or the local neighborhoods whose walls they adorn. Keto’s art feels almost dreamlike but hopeful and optimistic as well, and it doesn’t matter if he’s trying to be particularly “realistic” or not, because the portraits of community that he paints are vibrant and cheerful -- which explains why he’s often hired to ply his craft at schools around Maryland. Although he’s lately been painting around the northwest of Africa, DC-area residents can check out his craft outside the Prince Georges African American Museum & Cultural Center, for starters. Unlike so much other “weird” art, the paintings and murals of the two Ukrainian painters, Aec and Waone, never feels forced or totally removed from humanity. Instead, their stuff is imbued with political and social aspects that ground it and make it accessible to anyone that’s willing to look at it for more than two seconds. It’s art that the viewer themselves can invent their own stories about. 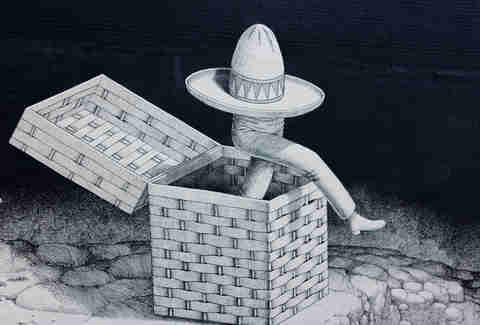 Such is the case with Chasing Tigerman on 115 E. Main Street, in which a dapper big cat, holding a smoking cauldron, pursues a disembodied pair of legs in a sombrero as it escapes a box: it leaves you plenty to ponder even as you appreciate the aesthetic for its own sake. As a college student, Aiko Nakagawa created a pirate TV station where she broadcast her own short films and music videos. The government eventually sent her a cease and desist letter. If there’s a cooler way to start a career in the arts, we haven’t heard of it yet. She moved to NYC in the early ’90s and worked for art legend Takashi Murakami. From there, she created a style that is wholly her own, something that would look at home in a gallery and the set of Blade Runner alike. 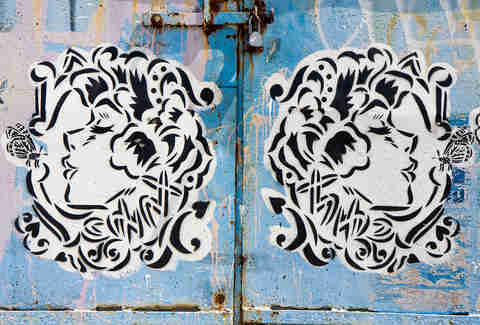 She blends Eastern and Western techniques into unforgettable pieces, like this one from Bushwick, where her signature style mixes retro clip art contours with slash-and-slice linework for a stencil that’s both salty and sweet. If you can’t find her work all over Brooklyn and Manhattan, a sure bet is her commissioned piece at the W New York hotel in Times Square... though you’ll need access to the ladies’ room to see her mural in its entirety. Os Gemeos is Portuguese for “The Twins,” and their work often feels like you’re seeing characters from the best animated film never made. There is something iconic about the people that the identical twin brothers paint, and that’s not surprising, considering that these two started as breakdancers and made their way into graffiti art. Their whole lives have been consumed by street-level expression. Hailing from Brazil, the brothers were given the chance to do something that not many others had been able to (legally) do there: paint the subway trains. That’s a testament to their reputation as artists and the quality of their work. Whether it’s politically charged pieces or works that are more dream-like, the brothers never fail to capture the imagination. 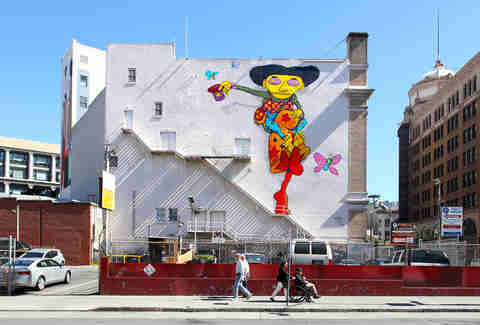 A visit to San Francisco a few years back gifted the city with numerous murals starring their signature, cartoonish, yellow characters, but one of their best is a collaboration with local street artist Mark Bode on Market Street’s Warfield Theater. It features a cowboy who is -- if his drifting pupils and purple eyeballs are any indication -- tripping his gourd off as he rides Cheech Wizard, a cartoon character created by Bode’s father. Born in Jamaica, Nari Ward’s work is the exact opposite of “pretentious artist type stuff.” Using his own specific experiences, he crafts things out of materials that he finds around his neighborhood. This “found materials” medium is more naturalistic and resonates in a way no technical lecture about paintbrush width ever could. 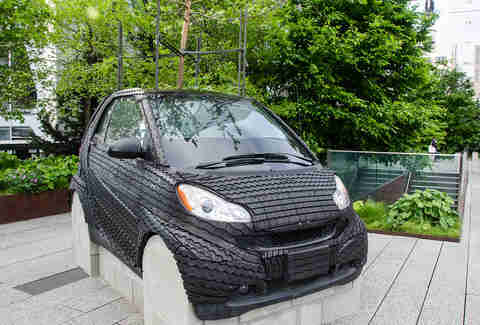 This is most noticeable in Smart Tree in New York’s beloved west side High Line Park, inspired by a memory that he had of an abandoned car with a tree growing out of the middle of it. So, with a bunch of tire treads, some cinder blocks, and by growing an apple tree out of the roof of the structure, he recreates that memory and gives us something that is recognizable, yet totally his own -- and in summer to autumn, delicious. 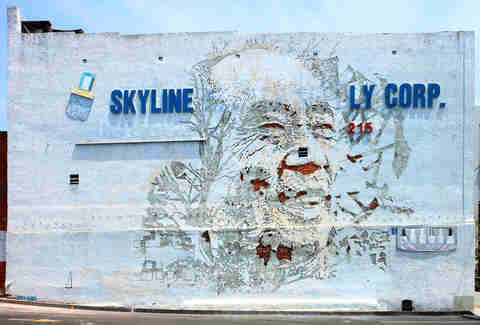 In 2014, Portuguese artist Vhils created Untitled in the middle of Chinatown in Los Angeles. By carving the shadows into the stucco, he created an ode to the history and place that Chinese-Americans had carved for themselves in the city. The art is joyous and displays an affection for the area and its singular brand of LA culture. Later in Sicily, Vhils would complete what is known as “the world’s largest mural.” A ridiculously awesome presentation, it is eight grain silos wide, and it, too, is a celebration of multicultural union. 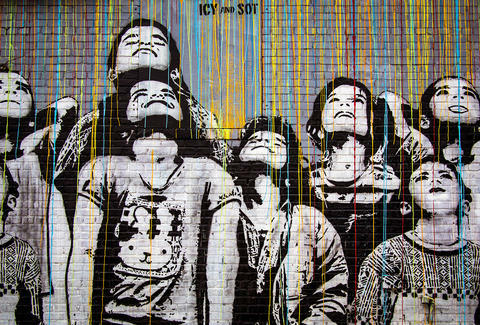 Wherever he goes, Vhils can’t help but make a beautiful statement.